Why wouldn’t it be? Think about its round shape. It was centrifugal force that sculpted the Earth, and all the planets. That force was greater at the equators, so they all bulge at the equators. Going towards the poles, that force would have progressively diminished, such that the outline of the planets would have gradually inclined inwards until, at the poles, there would have been no curvature. The crust at the poles would be very thin because the centrifugal force at the poles would have been very little; the matter there would have slid down and concentrated itself at equator and reinforced the crust there. And it can’t be full of molten lava because the Earth has a magnetic field. The magnetic fields touch the poles and the Earth serves as a conductor to close the circuit. If the inner core of the Earth had the temperatures which the Molten Core Theory stipulates that it does, then any magnetic properties would be lost as heat destroys magnetism. And it doesn’t take too much heat- this point is called the Curie Point. So the existence of the Earth’s magnetic field indicates that the core is not molten nor hot. Posted in Conspiracy Archives | Tagged: hollow earth, inner earth | Comments Off on Hollow Earth? 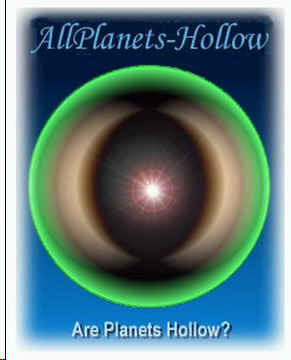 Can The Earth Be Hollow?